There is something about braised food in the winter time. Comforting, and almost earthy, they are what makes you crave when everything is frozen cold outside. And Korean food is not an exception. Here is one recipe I would like to introduce you. 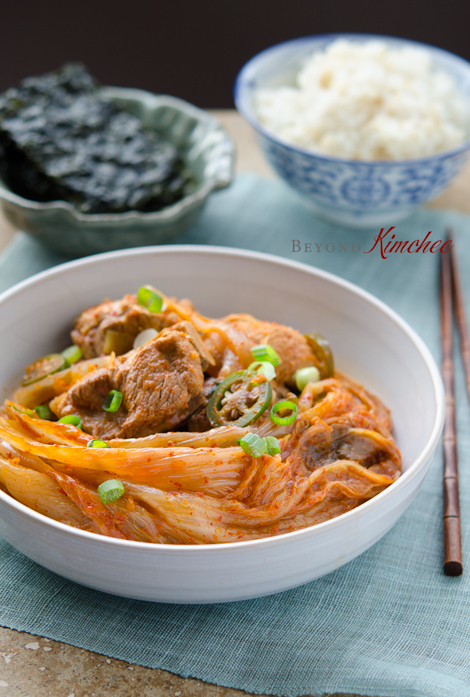 It is Braised Pork Ribs and Kimchi (돼지갈비 김치찜, dueji galbi kimchi jjim). And the kimchi I used in this recipe is called “moogunji (묵은지)”. 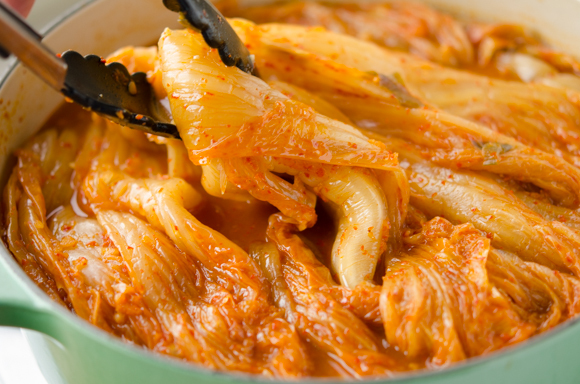 Moogunji is very old fermented cabbage kimchi. If you go to restaurants that are famous for their dishes made with kimchi in Korea, most will use this moogunji to make their dishes extraordinary. Some moogunji is as young as 6 month old, and some can be older than 3 years. Moogunji kimchi is not ideal to eat as is. It is too potent and sour (sometimes bitter), it’s not enjoyable at all. However this old cabbage kimchi is not going to be thrown away. It is FABULOUS in the braised food. So, you might think if you let your cabbage kimchi sit in your refrigerator for at least 6 month, it will turn into moogunji automatically. Well, chances are NOT. Moogunji doesn’t come that easily. 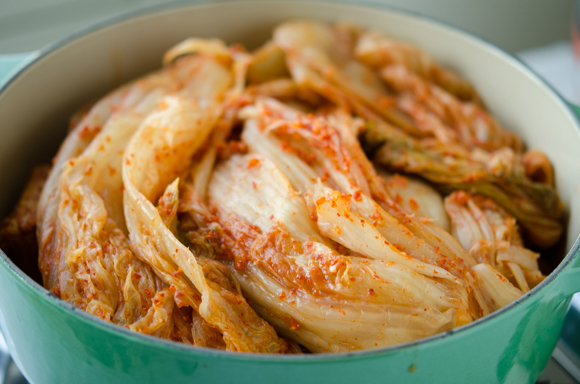 The cabbages are salted more heavily than ordinary kimchi for longer storage purpose. It ferments very slowly. It also requires certain level of consistent temperature and complete lockout of air. 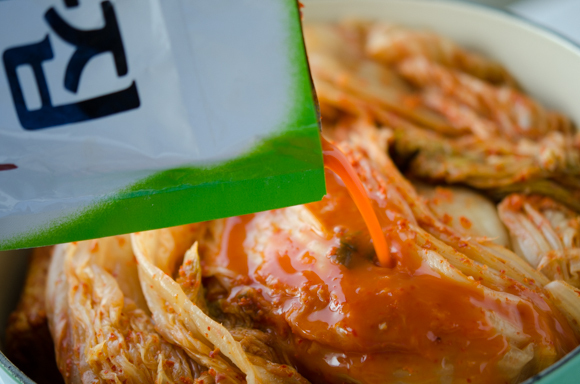 Well made moogunji kimchi can hold its firm texture with deep fermented flavor for years. 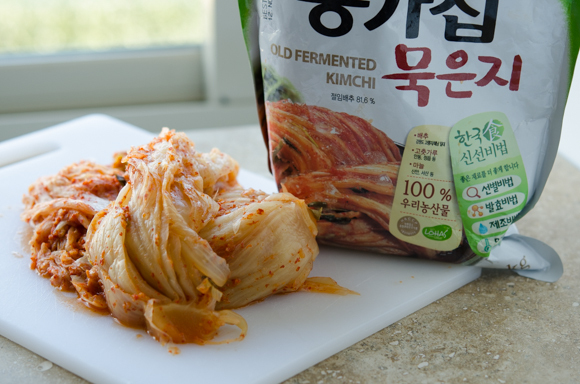 If you store ordinary cabbage kimchi in the refrigerator, usually they taste the best right after it got fermented and hold its prime fermentation for another month or maybe two. However, usually after about 2 month, they become very acidic and mushy in the texture. Any longer it may even become alcoholic if your kimchi is not properly stored. 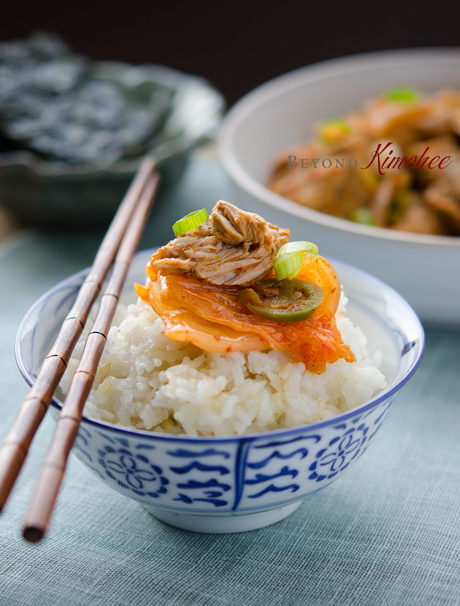 Traditionally Koreans keep their kimchi in earthen jars to keep in the outdoor, but these days many Korean household uses kimchi refrigerator to stock up their kimchi throughout the year. 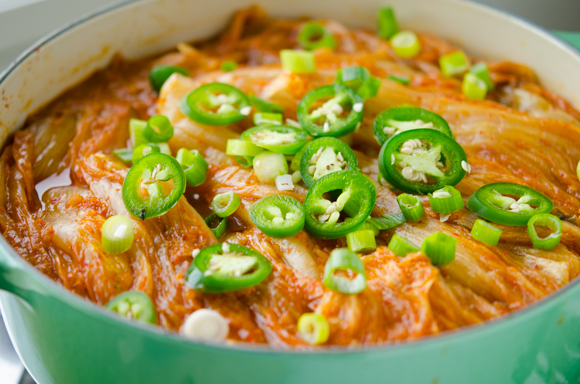 It keeps kimchi in the most ideal temperature to retain its taste and texture longer than ordinary refrigerator. Anyway, since moogunji is so wonderful to use in braising, you will find this recipe so delectable. 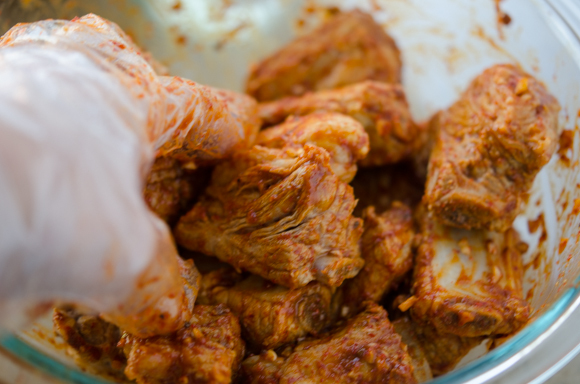 Pork is perhaps the best partner to cook with kimchi, and cooking with pork ribs will maximize its potential. 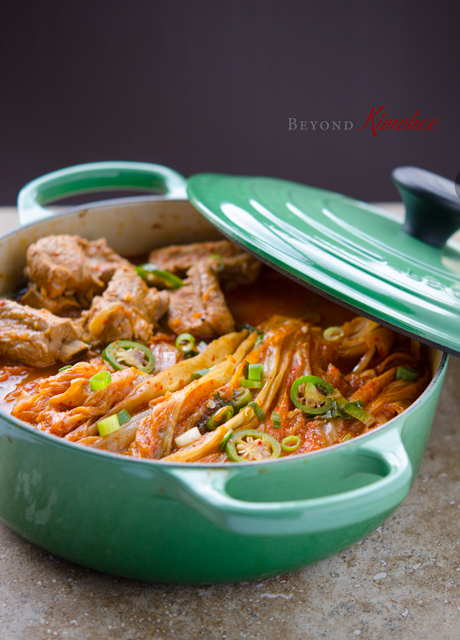 Long simmering will bring out the marrow from the bones and you will taste the best of what Korean kimchi can offer. 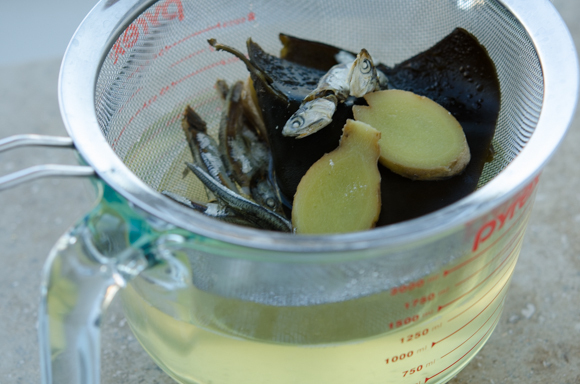 Make a stock with anchovies, dried sea kelp and a few slices of ginger. Basically you boil them in a water first, then simmer for 15 minutes. 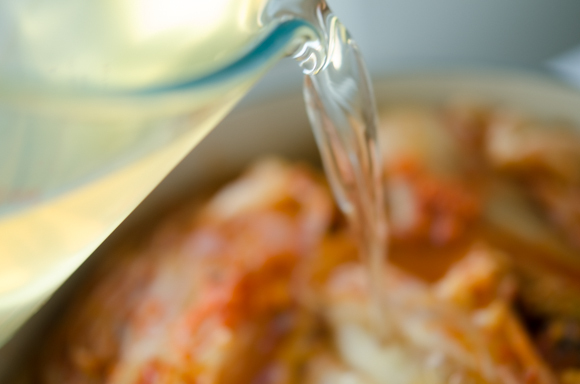 Drain the stock and reserve about 2-1/2 cup to use in this recipe. Set aside. Here is handsome looking pork rib pieces. You want to soak them in the water for at least 1 hour to remove some blood. Then boil a pot of water and briefly cook the ribs for 3 minutes. This will get rid of major fat and unwanted gunk from the bones. Rib meats are quite fatty and you want to reduce its fat amount before you add in the braising process to lower the fat intake. Drain the ribs and rinse with hot water. Set aside. 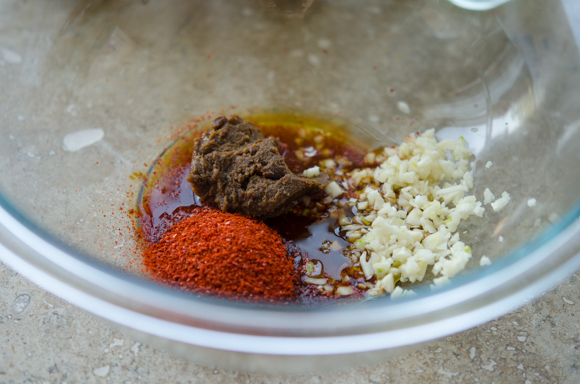 In a mixing bowl, combine Korean chili flakes, soy bean paste (doenjang), Korean soy sauce for soup (gook-ganjang), garlic, sesame oil, rice wine (optional), and sugar. Mix well. Dump the ribs into the bowl and coat them with the sauce. 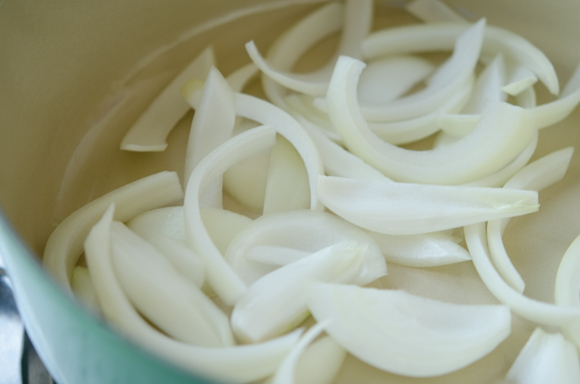 Spread sliced onion on the bottom of a heavy bottom braising pot (such as dutch or french oven). and cover with moogunji. No need to cut. Just put the whole thing as is. And don’t forget the kimchi juice inside of the package. It is precious like gold. Note: If your pot doesn’t have a heavy lid, you will need more amount of stock (extra 1/2-1 cup) to make-up for the steam evaporation. …and cover with a lid. Bring it just about to gentle boil over medium heat, then simmer over low heat for 1 hour. It is a good idea to shake the pot gently once or twice so the liquid will sip through all the nooks and crannies. Turn the kimchi to the other side and try to jiggle the ribs underneath so they get mixed in with onion. Cover again and continue to simmer for another 45 minutes to 1 hour. Lastly add green chili (I happened to have some jalapeños so I used them instead), and chopped green onion. Simmer 15 more minutes and you are done. Oh, boy! This is calling for a bowl of rice. The moogunji is so tender but retained its body, and the meat from the ribs is melting in your mouth. Oh, the flavor…! I can’t describe in English, but I can tell you that I emptied out two bowls of rice with this. You might wonder how you eat the whole piece of cabbage. You can cut it with a pair of scissor just like most Korean restaurants do. But in my house? I use the most divine kitchen tool I own – my fingers. I just tear the cabbage with my fingers (my thumbs and index fingers). My mother did this way with kimchi, saying “Kimchi tastes better when you tear them with fingers. Less knife, better taste”. I used to think it was so gross. But I now find myself doing the same action to my kids, saying the exact same words (but in English). This is the winter Korean comfort on its best and it made me feel like as if I was dining in a small rural town of Korea . How nostalgic…! 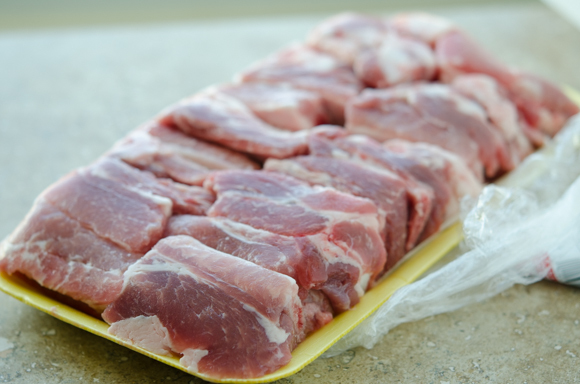 Soak the pork ribs in a cold water for at least 1 hour. Drain. 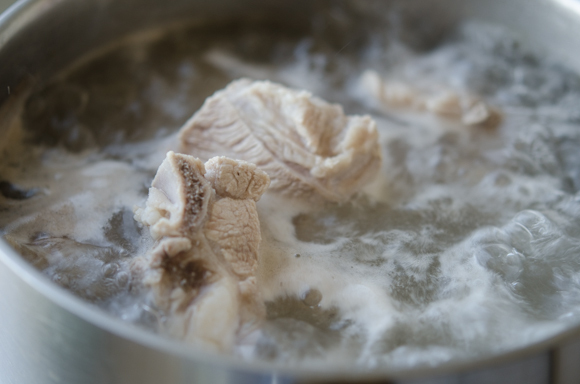 Bring the pot of water to boiling and add the pork ribs and cook for 3 minutes. 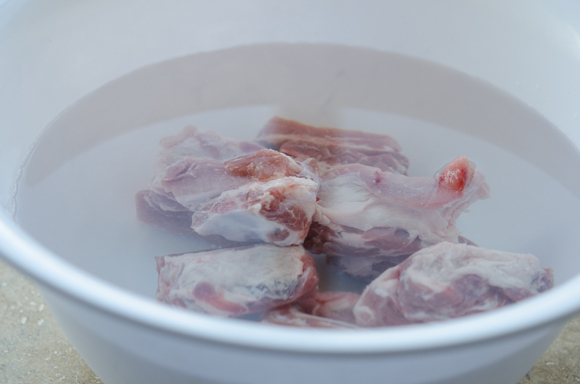 This will remove some fat and the unclean gunk from the bones. Drain the ribs and rinse them in hot water. Set aside. For the stock, put anchovies, sea kelp, ginger in water and bring them to boil. Reduce the heat to low and let it simmer for 15 minutes. Cool and drain the stock reserving about 2-1/2 cups. In a large mixing bowl, combine Korean chili flakes, soy bean paste, Korean soy sauce for soup, garlic, sugar, rice wine, and sesame oil; mix well. Add the pork ribs and toss all together. In a heavy bottom dutch oven pot, spread sliced onion on the bottom and top with pork ribs. Add the whole kimchi to cover the pork on top. Pour the kimchi juice and the reserved stock over the kimchi. Cover the pot with a lid and bring it on to medium heat to gentle boil. Reduce heat to low and simmer for 1 hour. Open the lid and turn the kimchi to the other side jiggling the pork ribs and onions underneath. Cover again and continue to simmer for another 45 minutes to 1 hour. Add the green chili and green onion to the pot and cook for 15 more minutes or so. Serve warm with rice. 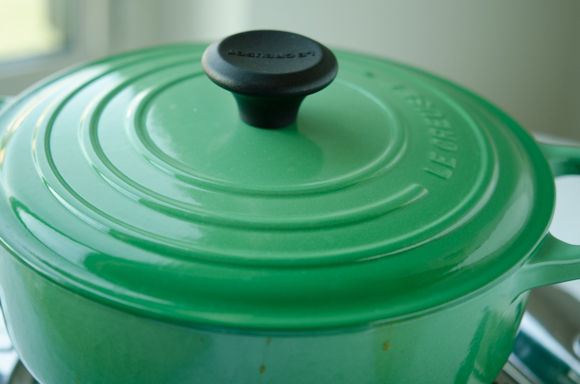 If your pot doesn't have a heavy lid, you will need extra 1/2-1 cup more stock to make-up for the steam evaporation. Dear Holly! I have to tell you that I visited Korea a little over a year ago for work, and came back home to London with a desire to start cooking Korean food. It's your blog I found, that helped me learn. Your post on pantry essentials was what I went to the Korean supermarket armed with, ready to stock my cupboards. I first cooked your cola braised chicken for my family on Xmas eve 2012. I'm pleased to report that my Korean dishes have become a staple in our house and a huge favourite amongst our friends! Thank you, for yet another mouthwatering recipe that I'll be trying in the next few days! Happy new year to you- and thank you again for everything you've done to inspire me- it's changed the way we eat!! Hi Micol, I remember hearing from you that you and your family enjoyed my cola braised chicken. It did make me happy. I appreciate for your sweet and thoughtful comment. One thing that motivates me to continue blogging is the reason which you wrote. It is my honor and happiness that my recipes can bring a joy to people. Thank you again and Happy New Year to you as well. This does look delicious! I will need to shop for the ingredients, though. One question: is Korean bean paste the same as miso? Though I certainly do not mind buying Korenan bean paste, I have a few types of miso already and wonder if they are the same. Thanks for the great recipe. Miso is milder. Doenjang is more pungent and robust. You can use the miso that is stronger and more pungent in flavor. I literally passed out with joy when I saw this post. I can't wait to try it!!! That is great, Serena. Hope you get to try this soon. I like the "Less Knife, Better Taste" motto! I always tear up herbs (like parsley) instead of cutting them for the same reason. Great dish - love the way it looks. Thanks for this. Exactly! I don't like to cut my lettuce with a knife either. I just tear them with hand. I think there is a scientific reason behind that. Oh wow, this looks so good!! I enjoy your final photos, but I look forward to seeing how you cook through step by step photos. I want to be in your kitchen! 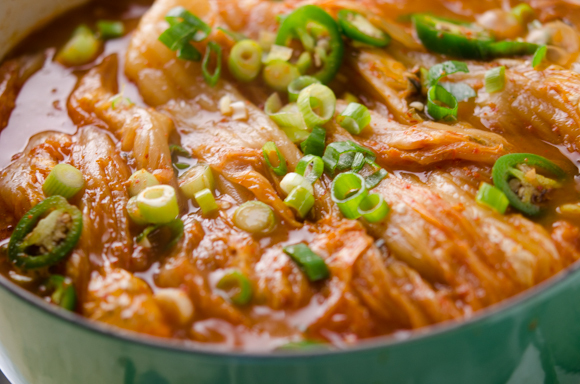 one of my favorite Korean food dishes. . looks absolutely delicious! Wow......... These look like very good. I like this. Great recipe. Sung, that is just so wonderful! I am glad that you loved it. Hi Mad Betty, Thanks for your compliment. Hope this recipe will turn out great for you. Let me know if you have any questions regarding the recipe. Enjoy your Superbowl game. Hi Vicki It is great to hear from you and thank you for your sweet comment. It is my pleasure that some of my recipes can help you bring your childhood memories back. Nothing is more comforting than enjoying home cooked meal that our loved one had prepared for us. Hope you get to enjoy more recipes. I will make some tteokgook soon. Cheers! Thank you for share.I like eat pork very must. HI Holly, I enjoy reading your recipes and have tried a few with great success. 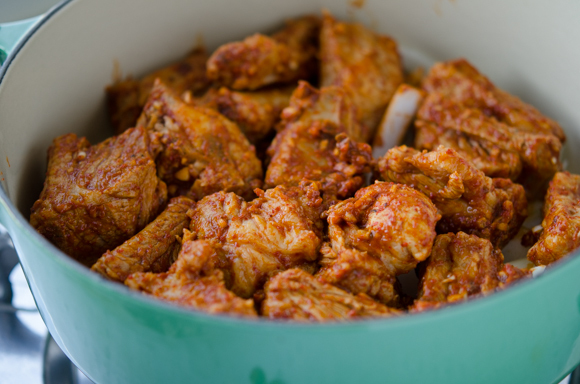 Quick question: Do you think I can make this Pork Ribs and Kimchi dish in a slow cooker? Would I need to make any adjustments? Thanks! HI Robyn, Using a slow cooker is a great idea. I don't think there would be any adjustments except the cooking time. Hope you like it. Hello Holly. 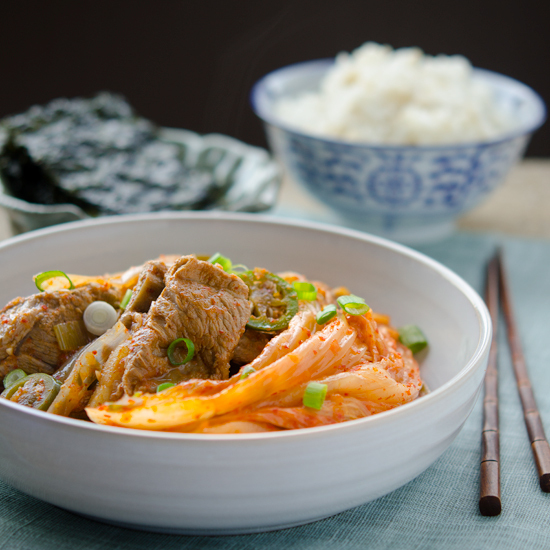 I love your blog and enjoy bringing Korean dishes into my Chinese Japanese American home. If I make this recipe using my slow cooker, you said to adjust the time. Would that be to extend the time? Or to shorten the time? Hi Miya I guess it depends on the temperature setting in slow cooker. If using high temperature, I would go for 3-4 hours. On low, 6-8 hours? I love your cookware. May I ask what size dutch ovens you're using for your recipes? It is a 3.5qt round pot, perfect for a small batch of soup and stew for about 4-6 servings. Hi Holly, fantastic job. I just salivate every time I look at the Pictures. Going to start with Jajjanmeyeon first. Woohoo. Hi Naomi Thanks! Hope you enjoy the Jjajangmyeon. Cheers! Hi Holly I cooked this dish using ordinary cabbage kimchi as I couldn't find moogunji here in Kuala Lumpur. I cooked a big pot and all finish within one sitting. It was so delicious that most of us have two bowls of rice with its. This is one recipe for keep. Thanks a lot Holly for another wonderful recipe. Hi Holly! Thanks for this recipe. I fell in love with Korean food whilst doing a study abroad year at Yondei. Hopefully my old kimchi will be ok for this or, if not, kimchi bokkum bap. A few months ago I made a windfall of cabbage kimchi and radish kimchi. But before it matured I suddenly felt violently ill, and soon couldn't tolerate any food but sweet food--you guessed it, pregnant. With my other pregnancies I loved red hot Korean food, despite nausea, but this time couldn't tolerate anything remotely spicy. So now I begin to crave cold weather food and kimchi sounds good again since I am five months along--fingers crossed the kimchis will still be okay. I am sure they will be mushy as you predict, but with a chigae or in fried rice I will just tell myself that is the desired mouth feel! Hopefully not too alcoholic in taste though or that it will evaporate quickly because any whiff of booze really turns me off completely. In any case, thanks for giving me hope to use my unplanned very mature kimchi. First of all congratulation on the exciting news. I had to go through severe nausea with my pregnancies and I couldn't eat kimchi either because of the smell. 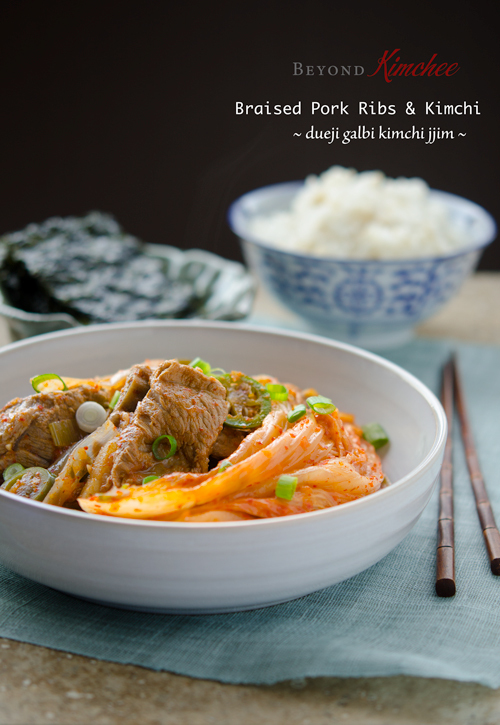 As long as your kimchi not alcoholic, they can be redeemed in stews, fried rice, and etc. Hope you get to try this recipe. It is perfect for the cold weather. Dear Holly, thanks for the congratulations. It must have been very hard to not want to eat or smell kimchi when you were pregnant since kimchi is essential for the Korean kitchen. Your husband must be congratulated for his forbearance and patience while you were sick. So sorry that you went through severe nausea for your pregnancies. Something you had in common with the Duchess of Cambridge. For the kimchi, the good news is miraculously it wasn't alcoholic so we had a wonderful kimchi chigae this evening. Next time: kimchi bokkum bap. But we are trying your Swiss chard rice recipe as soon as I get more chard/pak soi! You can use chicken stock (no salt added) or water. Although stock brings a depth in flavor.